Karen Brumelle’s paintings of landscapes and animal life reveal more than the eye can see. It almost feels like she is translating the language of her images. Her images are recognizable but through her choice of an unexpected and unusual colour pallet, she has allowed her muse to speak. She is a nature lover and photographs what ever catches her eye on her walks. Sometimes she manipulates the colours of her images on her computer. I was struck by her painting of the UBC Japanese Nitobe garden’s bridge, she has painted it in polarized colours and while I can recognize the scene, it isn’t just about the scene, she has expressed the stillness and peace one can feel there, just like in the beautiful garden itself. 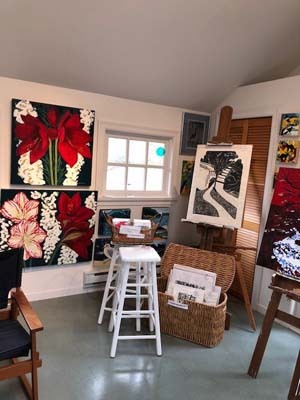 Guarded by a huge Douglas fir tree out back, her studio is light and airy, perfect for her mission, to "find the simplified heart of an image". Through altering the assumed colours, she alters our expectations and assumptions and we have to look deeper, beyond our 'normal' way of understanding what we see. Her images border on abstract but her love of a simple graphic look keeps us grounded. Karen also crafts beautiful and delightful block prints, mostly of animals and she makes paper collages that encompass all of her skills and sensibilities. She collects all sort of deliciously textured hand made papers locally and from her travels to use in her work.